This sassy little appetizer could have easily made it’s way onto a Fat Tuesday post. In fact, it was part of the very same meal that I featured in my post last Tuesday! It’s definitely not health food, but it certainly was delicious. Very simple and completely satisfying. 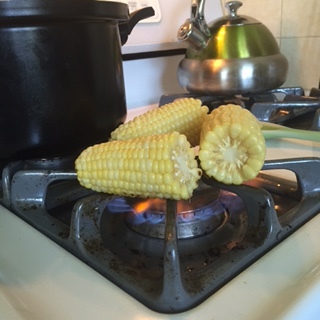 Cook corn in boiling water as you would for eating from the cob. Once tender, roast over fire if possible. I stuck it straight onto my gas burner and let it get some color on all sides. You could do it on a barbecue or under your broiler if you like. 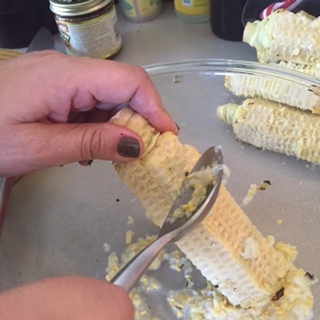 Once slightly charred, slice the kernels from the cob and catch in a bowl. Next, take a spoon and run it along the cob, releasing the corn milk. Discard cobs. Combine corn and corn milk, peppers, eggs, water and cheese in a bowl. Set aside. 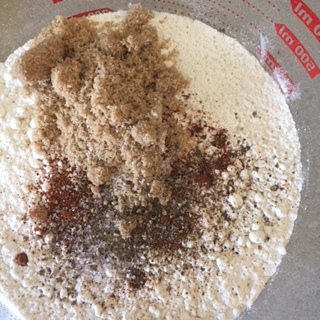 Sift together dry ingredients and add to wet ingredients all at once. Stir just until batter is moistened. Add oil to a large skillet and heat over medium high heat. Once oil is hot, carefully drop batter by the spoonful into oil. Once golden and crisp, flip and repeat. Remove to a paper towel to drain. Mix 1/2 cup mayonnaise, 3 Tbsp. 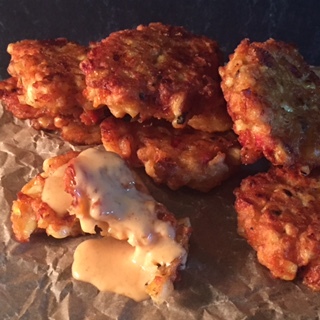 dijon mustard, 2 Tbsp Sriracha sauce and 1 Tbsp. 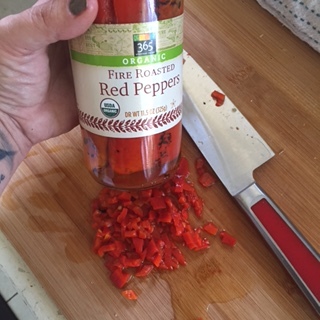 Chipotle chili powder together in a bowl. Refrigerate until ready to serve. Voila! Super simple and satisfying down home appetizer. Enjoy!